We stayed in room 114, close to pool and breakfast. The room was clean, there was a fridge and microwave which was an added bonus. The only thing that needed attention was the floor in the bathroom was coming up by the tub. Not an issue for us but just needs to be repaired. The pool was good but cold. I hear it was warmer the week before. The breakfast was minimal but okay for traveling adults. My kids were not impressed but that’s kids. Where to find Logan Lake hotels near an airport? 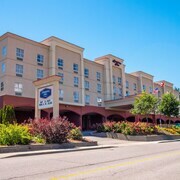 Where can I find hotels in Logan Lake that are near tourist attractions? 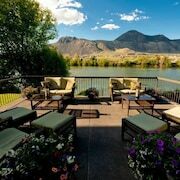 After a hotel in Kamloops, specifically in the Logan Lake area? There are 2 Expedia-listed hotels and apartments within a 0.1-kilometre (0.06-mile) distance of the center of town. 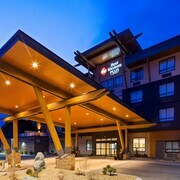 Expedia hotels within driving distance of Logan Lake include the Logan Lake Lodge and Copper Valley Resort. 25 kilometres (15 miles) from the center of Logan Lake, is the Lakeside Country Inn. Once you have seen the sights in Logan Lake, ensure you allow time to check out Thompson Okanagan's other cultural and scenic delights. Thompson Okanagan boasts rural landscapes, beaches, forests and rivers, and common Thompson Okanagan sights include old towns. Visitors in this part of Canada enjoy snowboarding and skiing. Merritt is 50 kilometres (30 miles) to the south of Logan Lake and is home to the Merritt Golf and Country Club and Nicola Valley Museum and Archives. 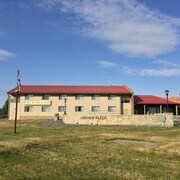 If you'd like to spend a few nights in Merritt, check out the room rates at the Quality Inn and Super 8 Merritt. Or, you could consider staying in Cache Creek, 45 kilometres (29 miles) to the northwest of Logan Lake, where you can pick from the Sandman Inn Cache Creek and Motel 6 Cache Creek BC. The Semlin Valley Golf Course and Arrowstone Provincial Park are popular places to see for those visiting Cache Creek. Before you say goodbye to Kamloops, ensure you catch some local sport. Visit Interior Savings Centre to the northeast of Logan Lake. 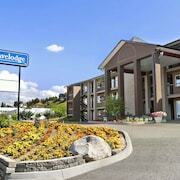 Stay near the action at the Holiday Inn Hotel & Suites Kamloops or the Hampton Inn by Hilton Kamloops. Expedia's travel listing is also a great way to discover more about Logan Lake. What are the most popular Logan Lake hotels? Are there hotels in other cities near Logan Lake? What other types of accommodations are available in Logan Lake? Explore Logan Lake with Expedia.ca’s Travel Guides to find the best flights, cars, holiday packages and more!